Prime Minister Sheikh Hasina started addressing a reception rally at historic Suhrawardy Udyan on Saturday afternoon. 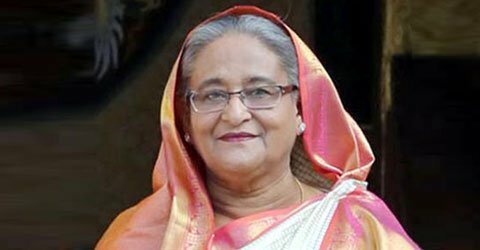 Bangladesh Awami League arranged the rally to accord a mass reception to her in recognition of her role in achieving remarkable development and achievements in different fields of the country. The achievements include attaining Bangladesh’s eligibility to graduate from a least developed country (LDC) to a developing one, successful launching of Bangabandhu Satellite-I, wining the Global Women’s Leadership Award by Sheikh Hasina from US-based NGO Global Summit of Women and her receiving D. Lit from KaziNazrul University of India. The Prime Minister reached the reception venue at 3:30 pm. The reception is being held at a huge L-shaped podium with Awami League Presidium Member Syeda Sajeda Chowdhury in the chair. The entire venue has been tastefully decorated. A big gate has been erected at the entry point in front of Matsya Bhaban to the venue while 40 other colorful gates have been erected from the city’s Matsya Bhaban to Shishu Park area. City streets from Prime Minister Sheikh Hasina’s official residence Ganobhaban to Suhrawardy Udyan have also been decorated with banners and festoons.